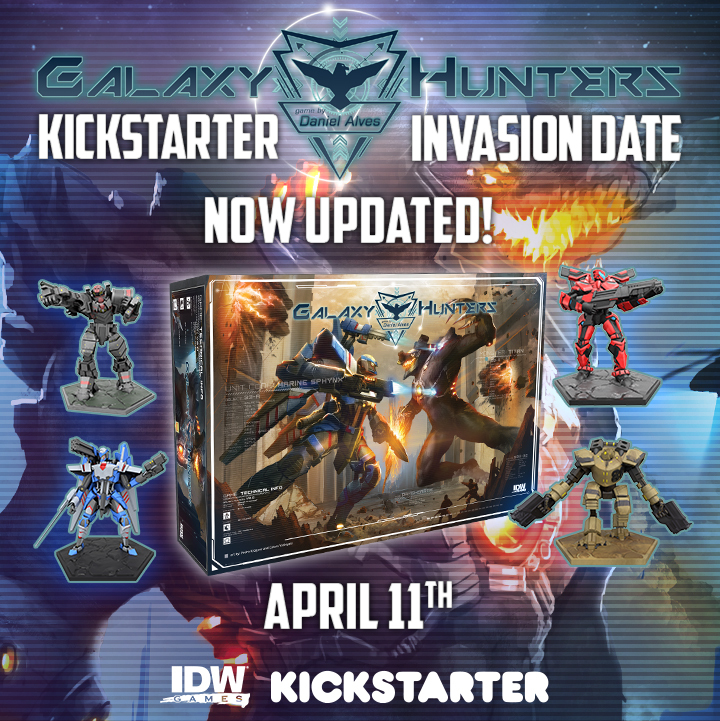 Galaxy Hunters Kickstarter Moved To April 11th! Attention Galaxy Hunters! An invasion is coming and we need to ready our planetary defenses! The mutations are heading from Ulaan and we need you! The Kickstarter which was planned to launch on March 28th, is now being moved to April 11th! We have an epic Kickstarter campaign planned for Galaxy Hunters and will be sharing more about this sci-fi euro game, coming to Kickstarter on April 11th, 11am PST! Be sure to join us for this adventure to become the best Galaxy Hunter and save the galaxy from invasion! Galaxy Hunters, a game of giant robots and massive monsters. This sci-fi worker placement game puts players in the role of mercenaries hired by Megacorps to hunt and harvest rampant mutations. Featuring an inventive pilot and mech combination system that unlocks new abilities and powers, Galaxy Hunters is a blend of crafting a unique character with the strategy of euro-game style worker placement. A game for 2-4 players dive deep into piloting their mech to fight against giant monsters and harvest the beasts for resources and money. Players upgrade their mechs with new weapons and items, giving them the ability to personalize their mech’s combat style while facing increasingly difficult monster mutations. Galaxy Hunters Kickstarter is launching on April 11th, and will be available in stores in August 2018.